Well, Easover has come and gone, and I’ve got a few egg cartons leftover from all those eggs. But, instead of chucking them, I decided we should have some fun. With Earth Day right around the corner, I had lots of ideas for all things reusable. And, my friend over at Tinkerlab was challenging people to get creative with egg cartons, and I had the perfect idea! 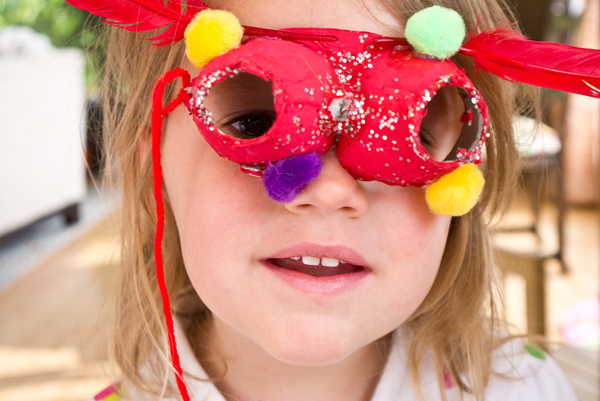 The tot has been really getting into dressing up and dancing about the house, so making simple masks with those egg cartons sounded pretty good to me – and my daughter, too. 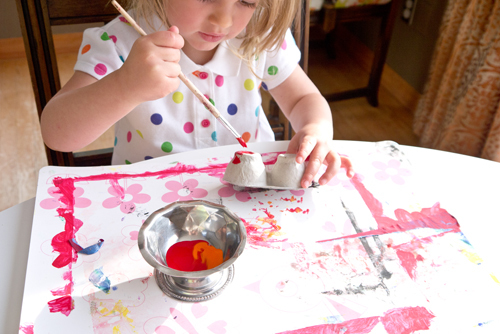 Then we added a sprinkling of glitter, which is also great for honing fine-motor skills! 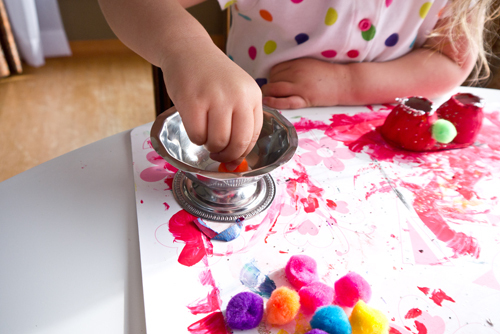 Once things had dried, I helped by cutting out the center of each cup, making eye holes, and then offered my daughter a selection of colorful pom poms and a bit of glue to dunk and them press on to her creation. 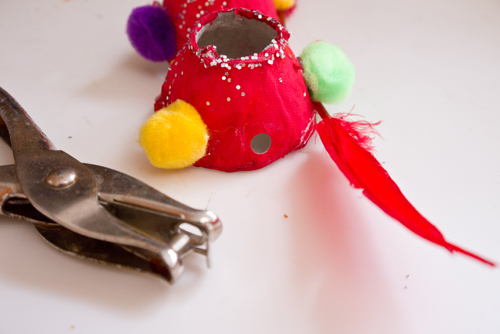 We found a few red feathers and I used the hot glue gun to secure them (and the glued pom poms) to the egg carton mask. To finish the mask, I popped a few holes in the sides and strung with a length of red string. If you have some stretchy elastic, that would work even better! 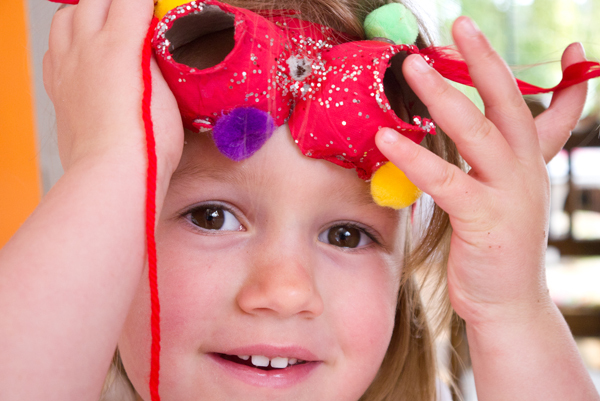 What’s great about this activity is you can make lots and lots of masks with all the different materials you have hanging around. 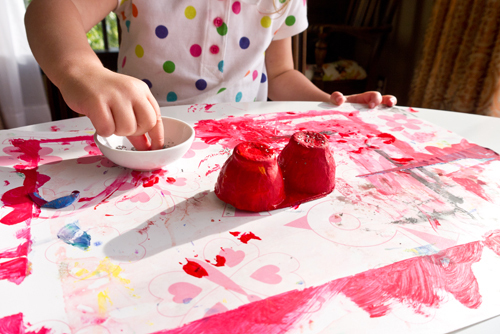 Older kids can use markers to add details, younger tots can get messy slathering on paint – and more paint – and you can play around with the mask base. Individual cups can be connected together with the help of colorful pipe cleaners, or several strung in a row for something really different. We enjoyed several hours playing with the finished mask (before it basically fell apart) encouraging my tot’s budding imaginary play skills. But, no problem! When it had finally come apart from too many put-on-and-tear-offs, we gathered together more materials and made another one! Her mask turned out so well. It’ll be a great addition for imaginative play!